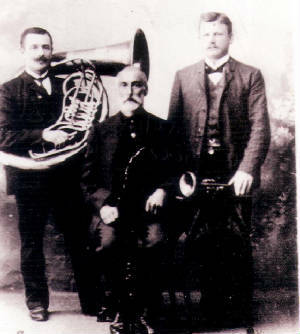 Lewis Storz (center), son of Moses, born October 12, 1827 (Wurtensburg) died December 25, 1912.
around October 12, 1827. It is believed he was brought up in or near Wurtensburg, Germany. He married Katherin Ledwick who was believed to come from Austria. They were married in Missouri, and lived in Bollinger, County, Missouri. I am not sure which one this was seems a little old to fight in war. Maybe it was great-grandfather. Well someone will straighten me out. 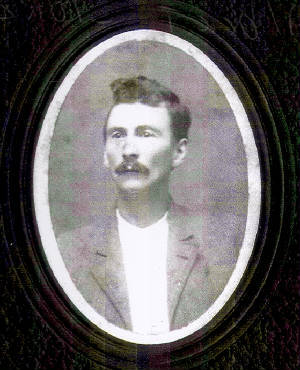 When Lewis Storz who had been in the Fremont Rangers with Enoch and had not seen him since 1869, saw him in the fall of 1875, when Enoch was a shoe cobbler, he reported he didn't look like the same man. Johnny Storz of Odyessa Texas has provided a wealth of information for this section. As soon as I get time I will upload the the photos and other information. This is Albert Storz, Grandfather Johnny, and brother to Charles, my Great Grandfather.